Mike's (IBxAnders) blog post announcing the Varnish caching enhanced vBulletin Boost plugin is great news for vBulletin folks to squeeze out more performance if you're stuck on the resource hog that is Apache web server. Admittedly, it was first time I heard of Varnish but the more I read up on Varnish, the more interested I was in testing this out on a local virtualized CentOS 5.5 64bit server. Mike's blog post led to a few vB customers posting over at litespeedtech.com's support forums asking if Litespeed had any caching feature similar to Varnish which can be used to boost vBulletin forum performance. Turns out Litespeed web server has it's own inbuilt cache feature similar to Varnish which can be utilised to boost vBulletin performance which is only available in Litespeed 2+ cpu licenses and above. The Litespeed free standard edition and 1 cpu licenses don't have the cache feature. These same vB customers also found that NginX web server also has similar fastcgi_cache feature. NginX FastCGI Cache - unfortunately, having difficulties getting this to work with NginX choking with 502 gateway errors and upstream timeout errors. 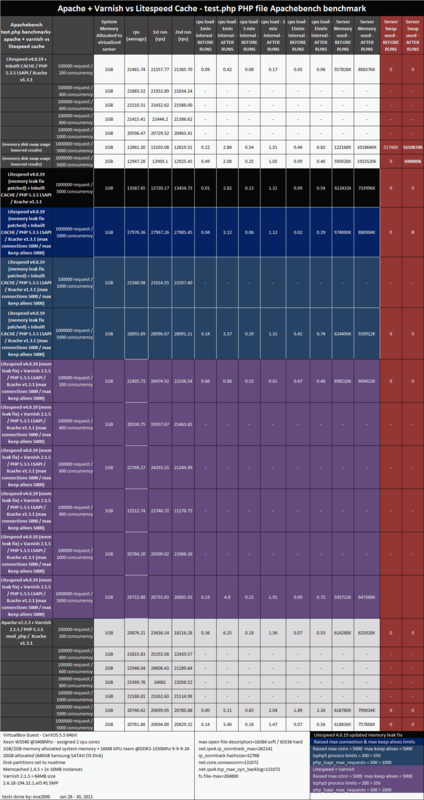 Litespeed 4.0.19 Cache had a memory leak which was later fixed and patched, so table below has both before and after fix results as well as tuned Litespeed settings results http://www.litespeedtech.com/support...ead.php?t=4638. 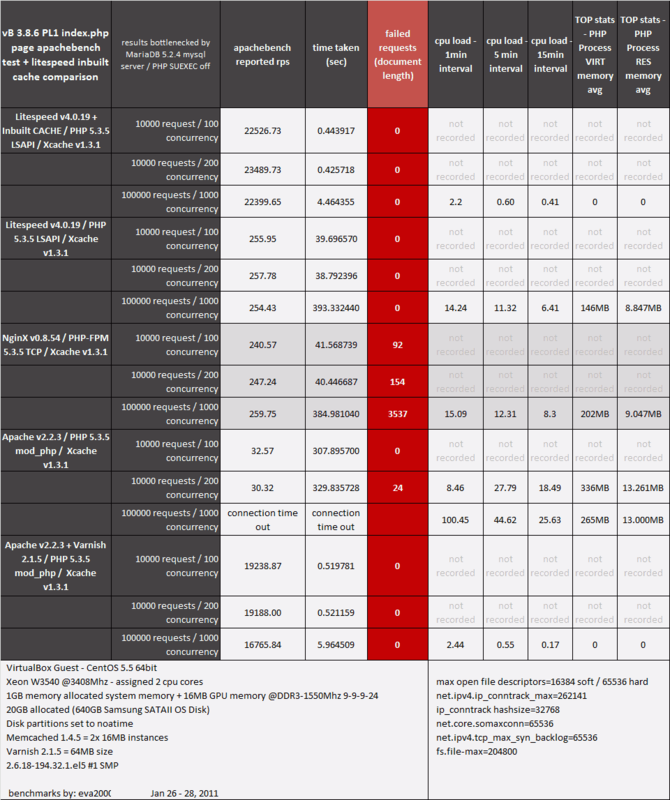 Also updated table to add Litespeed + Varnish for comparisons. Results are jaw dropping amazing for Varnish caching to boost Apache's performance in vBulletin index.php page tests from 32 requests/sec to 16,765 requests/. While Litespeed webserver's Cache feature is taking performance to the next level at 22,399 requests/sec in vBulletin index.php tests and surpassing 28,000 requests/sec in basic test.php php file tests. Once you factor in Litespeed's non-cached performance and scalability you can see that Litespeed is leading the way. Note, you have to remember both Varnish and Litespeed Cache boost is for guest visitors only. Logged in visitors would still need to depend on the inherit performance of each respective web servers - Apache, Litespeed and NginX. Update: This assumes using Varnish VCL in it's out of box configuration state but you can also change Varnish VCL settings for per user caching with hashed cookies so you don't need vB boost plugin for Varnish in per user cache VCL configuration. One such implementation of Varnish VCL in per user configuration is Unixy's Cpanel Varnish plugin - you can read differences and my thoughts here. Litespeed web server's Cache feature is still in it's infancy with further developments to come which is something I look forward to testing. Unfortunately, Litespeed Cache feature conflicts or doesn't seem to work with vBSEO .htaccess right now. Not sure when or if it will work. Secured a test vBSEO license, so will see if it can be made to work. But for now Litespeed Cache feature in Litespeed web server would have to work with vBulletin forums which don't use vBSEO. But Litespeed web server itself (with cache feature disabled) runs vBSEO fine like on Apache web server. Update: Mar 23rd, 2011: Update: Looks like Litespeed cache feature finally works with vBSEO see these 2 threads here and here. Mar 23rd, 2011: Update: Looks like Litespeed cache feature finally works with vBSEO see these 2 threads here and here. Hey! Where’s the love for NGINX? What do you think the program LiteSpeed ​​Web Server version 4.1.10?